San Diego Home Sales Increased 10.5 Percent in February, says C.A.R. 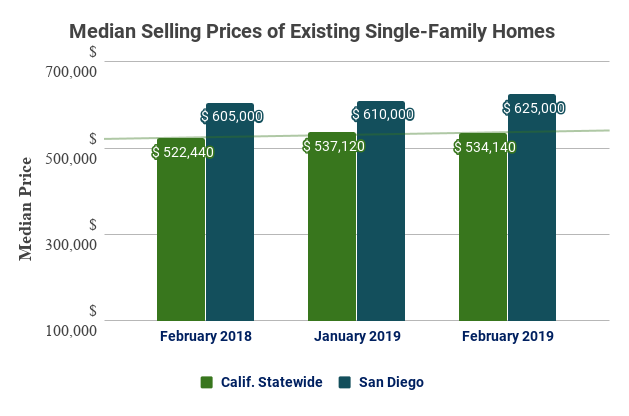 California home sales bounced back in February 2019 after hitting the lowest sales level in more than 10 years, according to the latest housing market report for home sales and prices from the California Association of REALTORS® (C.A.R). February’s annual sales level was the highest in six months, and the monthly growth in sales was the highest since January 2011, said C.A.R. Existing, single-family home sales statewide totaled 399,080 in February on a seasonally adjusted annualized rate, up 11.3 percent from January’s revised 358,470 figure and down 5.6 percent from home sales in February 2018 of 422,910. February’s decline was the smallest since July 2018, and the sales total was just shy of the 400,000 benchmark. February typically marks the lowest price point for the year, said C.A.R. C.A.R. said the statewide median home price in February 2019 was $534,140, down 0.6 percent from January’s revised $537,120 figure and up 2.2 percent from February 2018’s figure of $522,440. In San Diego County in February 2019, C.A.R. said the median home price of $625,000 was 2.5 percent higher than the $610,000 figure for January 2019 and 3.3 percent higher than the $605,000 figure for February 2018. C.A.R.’s sales total of 399,080 in February for existing, single-family detached homes in California is based on information collected by C.A.R. from more than 90 local REALTOR® associations and MLSs statewide. The statewide annualized sales figure represents what would be the total number of homes sold during 2019 if sales maintained the January pace throughout the year. It is adjusted to account for seasonal factors that typically influence home sales. “While February’s sales rebound is welcome news, the market will likely remain constrained as sellers and buyers sort through the realities of today’s market,” said C.A.R. Senior Vice President and Chief Economist Leslie Appleton-Young. “With the market about to kick off its homebuying season, buyers have a window of opportunity in the upcoming months as interest rates remain stable, there are more properties on the market to consider, and prices are more attractive. 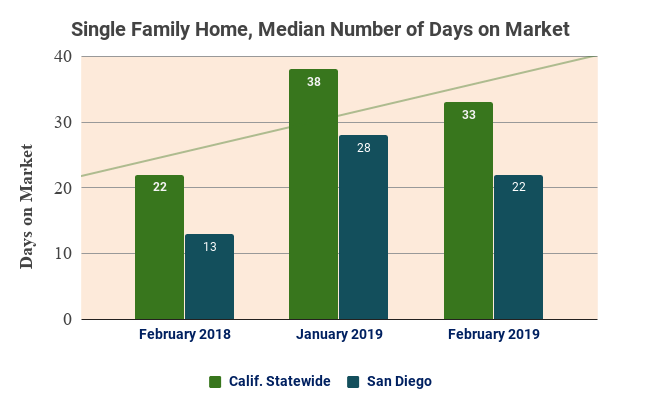 -- The median number of days it took to sell a California single-family home rose from 22 days in February 2018 to 33 days in February 2019. This compares to 27 days in January 2018, 37 days in January 2019 and 32 days in December 2018. 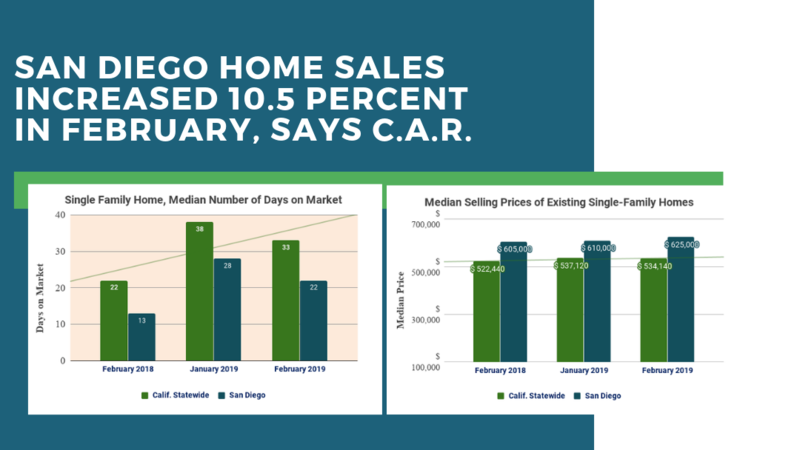 Meanwhile, in San Diego County, the median number of days a home remained unsold on the market stood at 33 days in February 2019, compared to 38 days in January 2019 and 22 days in February 2018. This compares to 21 days in January 2018, 28 days in January 2019 and 27 days in December 2018. -- While statewide active listings have been increasing from the previous year at a double-digit pace for the last eight months, February’s rate was the smallest growth rate in the past six months and the third month in a row that listings decelerated. February’s active listings were up 19.2 percent from a year ago. -- All major regions recorded an increase in active listings, with the Bay Area posting the highest increase at 41.9 percent, followed by Southern California (20.4 percent), Central Valley (16.2 percent) and the Central Coast (6.4 percent). Active listings increased in three of nine Bay Area counties by 50 percent or more with Santa Clara leading the way at 62.9 percent, followed by San Mateo (59.7 percent) and Alameda (50 percent). -- Home sales in the Inland Empire declined 10.1 percent from a year ago as Riverside and San Bernardino counties posted annual sales declines of 7.7 percent and 14.1 percent, respectively. -- The median home price continued to increase in all regions but at a more tepid pace. On a year-over-year basis, the Bay Area median price dipped 0.9 percent from February 2018. Home prices in Marin, San Francisco, San Mateo and Santa Clara counties continued to remain above $1 million, but all of the counties recorded annual price declines. -- Price growth remained modest in Southern California, inching up 1.4 percent from the previous year. San Bernardino County had the largest price gain (7.3 percent), while Ventura County recorded the smallest increase at 1.8 percent. Only Orange County experienced a year-over-year price decline. -- The Unsold Inventory Index (UII), which is a ratio of inventory over sales, improved on a year-over-year basis but was flat on a month-to-month basis. The Unsold Inventory Index was 4.6 months in February, unchanged from January but up from 3.9 months in February 2018. The index measures the number of months it would take to sell the supply of homes on the market at the current sales rate. The jump in the UII from a year ago can be attributed to the moderate sales decline and the sharp increase in active listings. -- The 30-year, fixed-mortgage interest rate averaged 4.37 percent in February, up from 4.33 percent in February 2018, according to Freddie Mac. The five-year, adjustable mortgage interest rate also increased in February to an average of 3.87 percent from 3.60 in February 2018. -- According to S&P CoreLogic Case-Shiller, home prices in the San Diego metropolitan area are going up, but slower than everywhere else in the U.S. San Diego metro’s home prices increased 1.3 percent in a year as of January. It was the smallest increase of the 20 cities covered in the index for the second month in a row. Home price increases are slowing across the nation, with many experts citing increasing mortgage rates. The most expensive markets are seeing the biggest slowdown. Prices fell in most major U.S. metropolitan areas in January, with San Francisco experiencing the biggest drop at 1.3 percent. -- Despite continued low unemployment levels and a generally strong economy, the anticipated increase in demand for California housing has failed to materialize, and the market will likely weaken heading into next year, according to the UCLA Anderson Forecast’s report on the California economy. Contributing factors include an exodus of people out of the state, increasing mortgage rates and uncertainty about the future. Regardless of the reason, the result is likely a weakening of the housing market. -- While affordability is the biggest obstacle preventing most renters from buying a home, 14 percent of California renters who can afford homeownership are declining to buy partly because they don't have the financial knowledge, according to C.A.R. Of the nearly 6 million renters statewide, C.A.R. says that 826,000 could qualify to purchase a median-priced home in the county in which they reside. A lack of financial literacy is one of the biggest barriers preventing renters from becoming homeowners, said C.A.R. -- Zillow has begun buying and selling homes in California. Riverside is the first California market for Zillow’s program, called “Zillow Offers,” which allows potential home sellers to request a free, no-obligation cash offer from Zillow to buy their home. Once the seller accepts the offer, they are able to pick their own closing date. -- Redfin recently ranked San Diego County as the third least affordable housing market in the U.S. for low-income families, ahead of just Los Angeles and New York City. The real estate data company reported that the homeownership rate in San Diego among income earners in the bottom quarter was just 37.6 percent in 2017, which is an increase from the 33.5 percent figure registered in 2012. Low-income home ownership rates in Los Angeles and New York were 31 percent and 35 percent, respectively. Los Angeles and San Diego also appear in the top three least affordable places for millennials. The analysis included the 50 largest metro areas in the U.S.
-- According to real estate website Truilia, San Diego County has the second-most home price reductions in the nation so far in 2019. Price reductions are more common in the winter months, but San Diego County hasn’t seen as many cutbacks since 2014 when the market was still crawling out of the recession. Twenty percent of homes for sale in February had a price drop, the most of any California city. At the same time last year, the percentage was 10 percent. -- San Diego is the 7th worst place for first-time homebuyers. Bankrate, a financial products company, recently rated the best and worst metro cities for first-time home buyers and San Diego came in at the No. 7 on the worst list. The ranking, which looked at the 50 largest metro areas, was based on affordability, culture, housing market tightness, job market and safety, among other measures. Pittsburgh, Pennsylvania, came in at No. 1 for the best metro for first-time buyers while California cities like San Francisco, Los Angeles, Sacramento, San Jose and San Bernardino all made the top 10 of the worst list. -- San Diego County has the ninth highest one-bedroom apartment rent in the nation, according to the latest report from industry tracker Zumper. Local renters can take solace in the fact it's still a far cry from San Francisco, which continues to set new records for the U.S. Zumper placed San Diego County’s median rent for a one-bedroom unit at $1,910 a month while the median San Francisco renters are paying a whopping $3,690 a month. New York City ($2,870/month) and San Jose ($2,540/month) round out the top three. -- San Diego County’s unadjusted unemployment rate dipped to 3.5 percent in February, with both farm and nonfarm employment showing gains, according to the California Employment Development Department (EDD). The county’s adjusted unemployment rate sat at 3.8 percent in January, its highest point since the third quarter of 2017. February’s unadjusted rate is the same as its revised 2018 unemployment rate, the EDD said.